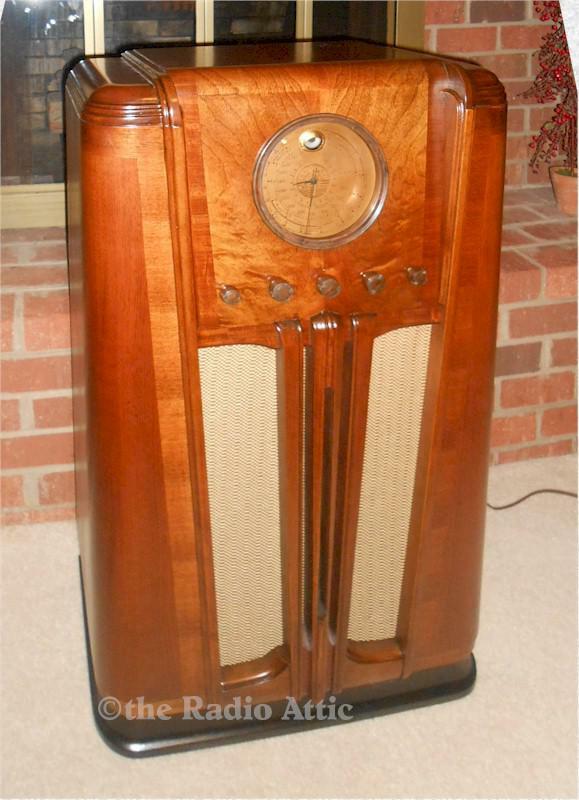 This is one of the "Sears Golden Jubilee" series of radios with different sized gold dials and styles. It has the largest and most impressive gold dial of the series at six inches diameter. Smaller than most consoles at 38"H x 22"W x 12"D, so ideal if space is a problem. Has ten tubes with push-pull output, including a "magic eye" tuning tube. Receives AM broadcast band and two short-wave bands, covering up to 18 MHz. Restoration of the cabinet with correct nitrocellulose lacquer was performed, then rubbed to a semi-gloss smooth finish. It displays great! Knobs are original, grille cloth is reproduction, tuning eye is new and bright, dial lights up brightly. Complete electronic restoration was performed (see how I restore radios link on my main page), The original flawless ten-inch diameter speaker provides wonderful sound! Aux input cable is included so you can plug in an iPod, CD player, etc. and play audio through the radio. If Bluetooth receiver is added you can stream tunes from phone, computer, etc. Pickup preferred but shipment is available, allow $150 to your local Greyhound station. 90 day warranty. You will love this radio!